Portland, Oregon's Foghorn Stringband presents a sound rather unique among oldtime bands. The key to that sound is the mandolin. There have been, of course, other oldtime groups that included the mandolin, the Leake County Revelers in the 1920s for one, but in such bands, the role was more that of a rhythm instrument; the Foghorn Stringband takes a different approach. On all but a couple of the 15 tracks on this their third release, Caleb Klauder's mandolin lead doubles the melody line of fiddler Stephen Lind. 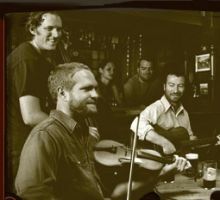 Fresh sounds are hard to create in oldtime music, but the Foghorn Stringband has succeeded, and this album proves it.